Romantic, elegant, and fragrant, bridal bouquets that feature roses are one of the most popular choices for both bridal and bridesmaid wedding bouquets. These luxurious bouquets are available in a wide range of styles, sizes, and colors. Roses can be used in any season for different bridal bouquet designs. Roses are always a favorite with brides, with classic white, simple bouquets being the top-rated design. White roses are always popular with brides, but the romance of a rich red hue is a close second. Add a little baby's breath to a thick bouquet for extra texture and delicacy. A white rose bouquet can easily be personalized by using small blooms of another type of flower in a different color to match the wedding colors. Choosing only one or two colors for the entire bouquet lends it a graceful elegance. A larger bouquet can be more unique by layering different colors of the same size flower. Ivory and light orange roses are romantic hues for summer or fall weddings, or you can choose any colors to match your wedding décor. Lavender roses are trendy and unusual. Make your bouquet even more unique by choosing alternative accents such as berries, grains, grass, grapes, or beads instead of more flowers and basic greenery. Roses come in a wide range of colors, and combining bright shades such as red, orange, and yellow with a startling purple accent can create a colorful and memorable bouquet. To blend all the colors together, wrap the stems with a neutral shade of ribbon. Ivory roses are simple and sophisticated, and they can be made even more regal by adding glittering gold accents. This is perfect for a fall or winter wedding, or any wedding with a princess theme. Baby's breath is a popular filler to use with roses, and using larger amounts of baby's breath is economical while creating a delicate, full bouquet. Other fillers include ivy, buds, and ferns, or affordable flowers such as carnations or daisies. Add a vintage touch to your wedding bouquet by choosing an unusual fan shape. Lines of roses bordered by greenery or baby's breath can create an elegant fan perfect for a Victorian wedding theme. Roses can often be found in two tone hues, such as peach and yellow, red and peach, or pink and white. By choosing two tone flowers, you can create a more interesting and unusual bouquet with a delicate coloration. A simple bouquet of yellow roses is a sweet, joyful option for spring or summer brides. Add just a bit of greenery and bind the bouquet with a simple coordinating ribbon to preserve the innocent effect. Using rose stems of different lengths can create a cascade effect for the bouquet shape. This is popular for brides with full skirts because the bouquet will help balance out the wedding dress design. Choose unique, rich blue roses to carry your something blue down the aisle. Blue, especially dark blue, is a more rare shade for roses, so be prepared for higher prices if this is the option you choose. Round bouquet shapes and pink roses are both popular options, and you can combine them into one gorgeous, classical bouquet. 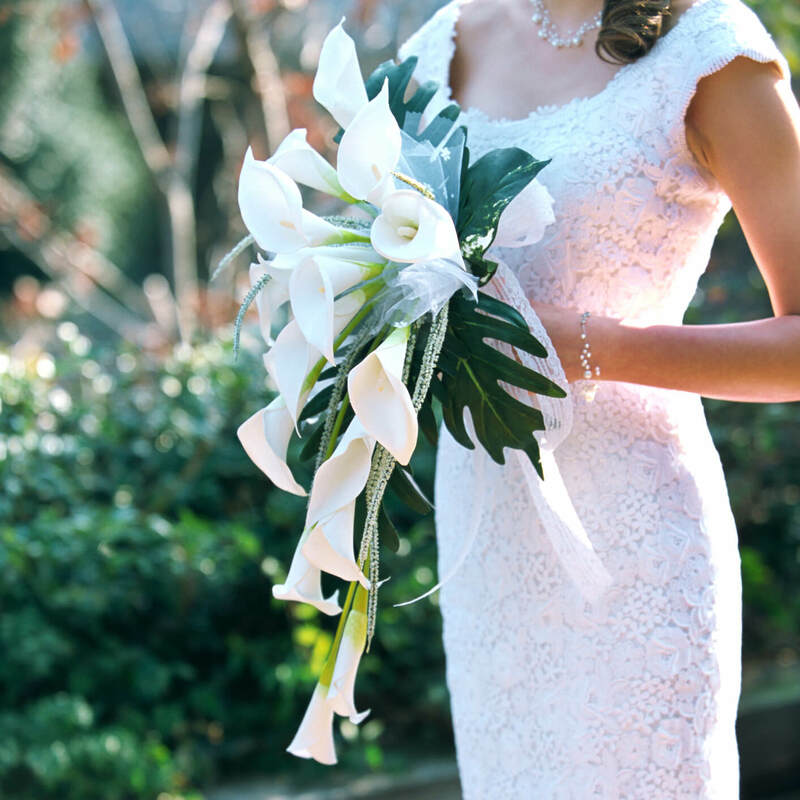 Large bouquets can be awkward, however, so be sure you carry the flowers appropriately to showcase their beauty. For a cascade bouquet shape without drooping blooms, consider long grasses that extend down from the base of the flowers. Other options include ribbons, strands of pearls or beads, or satin streamers. For a unique winter wedding bouquet, choose bright white roses accented with pine boughs instead of softer greenery. Other options include holly leaves and berries, cedar boughs, or even holiday garland to accent the flowers. Roses have thick blooms that can easily withstand pin accents. Pearls and crystals are popular to insert into the flowers to add an extra sparkle and romantic touch to a simple wedding bouquet. For an autumn wedding, choose roses in rich fall shades such as yellow, orange, ivory, and red, combining them in a random bouquet that simulates the blend of autumn leaves and their beautiful colors. Roses are perfect for mixed bouquets, and they can easily combine with unique greenery and accents for a truly memorable arrangement.